At All Uniqueness we are confident that the products that we supply are of the highest possible quality, and that our customers will be 100% happy with their purchases. However, should there be a fault with any of the items that you have ordered, simply return them to us within 14 days for a refund or exchange. Please note this does not apply to bespoke items or engraved items unless there is a manufacturing fault. We aim to provide an exact representation of all products listed on our website; however, as the majority of our items are handmade some images may differ slightly to the product received. In some instances certain items may be subject to availability, if an item is unavailable we will always notify you in advance and aim to offer a no obligation alternative. All items displayed on our site are accurately priced and contain no hidden extras, added extras such as engraving and postage will be clearly displayed at the point of check out. In the event of a pricing error, due to a technical issue or human error we reserve the right to cancel any items bought at this price and refund any monies paid via the original method. For more information see our returns policy. Our guarantee policy does not affect your statutory rights as a consumer. Our highest priority is to ensure that our customers are 100% happy with everything that they purchase from our store. With this in mind, we offer a 14-day exchange policy on all products sold through this website. This guarantee does not affect your statutory rights as a consumer. If you decide within 14 days that the product you ordered is not for you, please contact us via email to arrange an exchange. Goods must be returned unused and in their original condition & packaging. Please note that we are unable to exchange unwanted bespoke items as these are made to customer specifications, we are also unable to offer an exchange on engraved items or items returned after the 14 day period. In some instances we may contact you to discuss specific requirements prior to commissioning your item to confirm that the item will meet your needs and is therefore not returned. This may include high value items or items not generally kept in stock. In the unlikely event of your purchase developing a fault within the first 30 days of purchase please contact us to arrange an exchange or refund. If your item is faulty please allow up to 30 days to receive a refund. For an item exchange please allow up to 28 days to receive your replacement item. For your protection, we recommend that you use a Special Delivery service when returning any item to us. Please note that you will be responsible for the costs of returning the goods to us unless we delivered the item to you in error or the item is faulty. Our returns policy is in addition to and does not affect your statutory rights as a consumer. We accept all major credit and debit cards, and clear payments via our own secure on-line payment gateway. At All Uniqueness we are committed to protecting your privacy. We want to ensure that you can feel totally comfortable when placing your order with us – safe in the knowledge that your personal details will be treated with the utmost respect. We will only use the information that we collect about you lawfully (in accordance with the Data Protection Act 1998) and according to the Web Trader Code of Practice. All personal details are held securely on our dedicated secure server with restricted access. We will NEVER make our databases available to any other organization – so you can rest assured that your contact details will not be used by any third party for marketing purposes. We will give you the chance to refuse any marketing email from us or from another trader in the future. You can remove yourself from receiving marketing material from us at any time. We will never collect sensitive information about you without your explicit consent. The information we hold will be accurate and up to date. You can check the information that we hold about you by emailing us. If you find any inaccurate we will delete or correct it promptly. If you have any questions/comments about privacy, feel free to contact us. 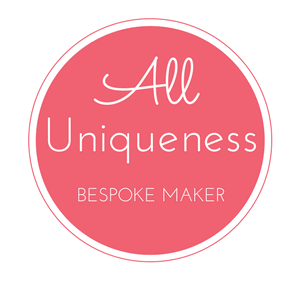 The All Uniqueness online store is hosted on our own restricted-access secure, dedicated web server – unlike most stores, which share server space with many other on-line sites. Once this process is complete we will immediately e-mail you confirmation of your order, including a full copy of our returns policy and guarantee for your complete convenience and peace of mind. The majority of the items we sell are made to order, with this in mind please allow up to 20 days from date of order to delivery of your item. We are aiming to deliver 90% of total orders (door to door) within 1 ~ 2 weeks after your payment. This time frame covers the whole handmaking period which is a complicated and time-consuming process of modelling, cutting, engraving and plating etc, and a shipping period. If you have ordered a diamond set or bespoke item please allow 4 to 6 weeks for delivery. If your order is urgent we may be able to help, please contact us via email to discuss your requirements. When your item is received with us an email notification will be sent. If there are any problems or questions about shipping please contactus. Are you looking for unique and affordable handcrafted jewellery, to go with your favourite outfits, a wedding dress or to give as a beautiful gift? You are in the right place! We deliver to worldwide cities from our UK and USA workshops for free! Copyright © 2018, All Uniqueness, All Rights Reserved.